Given we have hatched a few chicks out over the last week, we felt I should blog about incubating and hatching; as it’s been quite a while since we discussed it. Now we are not experts and are only able to comment from our own research and experience. Always feel it is necessary to stress this, as I am sure there others that would do things differently, or have had different experiences/ outcomes. Especially as we do this on a small scale using fairly cheap/accessible equipment. Previously we had compared the results and operation of ours to that of a borrowed and more ‘advanced’ (though older) incubator (that belonged to a friend); leant to us as we had excess eggs to incubate. To be honest our simple system suits us fine. Anyway, starting from the beginning (and no we do not wish to debate which came first!). This may seem like an obvious point; however we do regularly get asked whether you need a rooster to get eggs and/or chicks. So just to clear up any misconceptions- hens on their own will still produce eggs, however they will never be fertile. Therefore you need a working rooster/ cockerel in with your desired mother hens to (hopefully) produce fertile eggs. So how do you know a cockerel/rooster is ‘working’… to be honest other than witnessing them in action (and some are more discrete than others) the only true answer would be to incubate the eggs. However in theory if their crowing, then they should be capable to ‘working’. Although in fairness our current Light Sussex rooster was working well before either of us saw him in action or heard him crow. As such we had not incubated any eggs from the girls, one hen actually sat and hatched out a couple of chicks, proving he was in fact ‘working’. But he has been the only one we have had that has been that discrete and quiet. Another sign that the cockerel/rooster is working would be war marks on the hens. Some males can be quite rough on the girls. And as a result the girls may have less or thinning of the feathers on their back, even bald patches around the back of the neck and occasionally a few missing tail feathers. Not to get too side tracked, the main factor is you either some laying hens that have a rooster in their flock or you need to source ‘fertile eggs’. We have been asked to sell fertile eggs in the past, but to be truly honest neither of us are completely comfortable in doing this. Only because we’re hoping they are fertile, given they have been collected from hens running with a rooster. Not because we have any way of guaranteeing that they are in fact fertile. There’s a really good blog about the myths of fertile/in-fertile and incubated/non-incubated eggs, that explains a lot of the common misconceptions. If you are collecting your own eggs this may take a few days, depending on the size of your flock and their laying rate. Many laying breeds will lay daily, given they are not moulting , broody or affected by the weather. Naturally a hen may lay 10-12 eggs before ‘sitting’, though I have had young girls sit on as few as 3. So the first egg they lay could be 10+ days older than the last. Personally we only collect for up to a week at a time, though generally we try to set our eggs within 5 days. Only because the blastoderm (fertilised point within the egg) [non- fertilised would be hens genetics only and is called a blastodisc] is suspended awaiting the right conditions to develop into an embryo, and eventually a chick. This genetic material will have a shelf life, as does the rest of the egg. So we try and set them as soon as possible. Remember a fertilised egg will still never be a chick unless it is set under the correct conditions (under a hen or in an incubator), so are perfectly good for eating. When collecting your eggs we once read (and don’t ask me where) that the eggs are best stored point down. We also write on our eggs using permanent marker what kind of chick/chicken it is or is from. And once they are ready to set we also add the date. We have had comments regarding this, it is not ideal to plaster your egg in graffiti as the shell itself is porous and any chemicals etc used on the outside could affect the developing chick. In the same way that dirty eggs are not ideal for the same reason; and if you’ve ever kept chickens you will learn that some are naturally cleaner than others! (this does not seem to be a breed thing, its individual). So brush off as much ‘dirt’ or other contaminants as possible, but do not clean the egg. At most I have used a clean cloth and dampened it with warm water, then immediately dried the exterior; as water will also affect the egg… So best to do as little to the egg as possible. Also store your eggs in a cool dry place, not more than 25°c, else you could start the process. We have successfully incubated refrigerated eggs before (though only as an experiment) and this does appear to affect the rate of successful incubations... so refrigerated eggs is not ideal. (Please do not try incubating eggs in your fridge as they are likely to be older and not to be fertile to start with- as egg producing farms do not require their eggs to be fertile, and therefore would not have a rooster with them to start with). Either way once you have collected or received your eggs you will need to set up an incubator. Ours is a simple 48 egg (max capacity) unit, with a temperature dial and the humidity is controlled by the amount of water in the base. As I mentioned earlier we have tried another model that had digital temperature settings along with humidity controls. However we found that we were studying it too much. And I know others that have had mixed results with these set ups and think it’s probably from fussing or fiddling too much. The more you can change, the more we would. But we have had pretty good results with our basic system, so we’re not complaining. We generally clean ours and like to sterilise it before use using Breathe ezy, a form of stabilised chlorine dioxide that is used in the poultry industry and is water soluble. (But this is purely personal) Once clean we set the unit to temperature and pour warm water in the base. This is then run for a day to warm up. We check the internal temperature using a digital thermometer over an hour or so to ensure it is maintaining temperature. Ideally it should be between 37°c & 38°c for chickens. It would also be an idea to let your eggs rest at room temperature whilst the incubator is warming up, especially if your eggs have been shipped- this will allow for the contents to settle. Now with this level of basic you do have to perform some tasks that an automated system would do for you; such as turning the eggs. This needs to be done from day 3 (first 2 days they are o be left alone) and then to not be turned for the last 2. In theory a chicken egg takes 21 days to incubate (turkeys and most ducks take 28 days and Muscovy ducks and geese 35); though the temperature and humidity levels can affect this also. In our experience we usually see some movement, evidence of hatching on the 20th day and most/ all are our by the end of day 21. A hen would naturally rotate the eggs throughout the day, so that the embryo develops in a suspended position and doesn’t become stuck to either side. We turn ours morning and evening; when we have eggs set this just becomes part of the routine. So the incubator is set up in an accessible place, ours is on our kitchen bench. That way it is visible and will jog your memory… as they saying goes “out of sight, out of mind”. You also need to monitor the water levels, top us with warm water to maintain the humidity level. Both temperature and humidity will fluctuate according to the external environment. In winter the unit may have to work harder to maintain the temperature, whereas summer months the humidity maybe higher. So once your eggs are set, we are back to the subject of fertility, or at least successful incubation. After 5-7 days it is possible to “candle” the eggs. (this is easier with some eggs than others- ducks for example have a more opaque shell, where chickens and turkeys can be quite translucent). Candling involves placing a light (torch etc) onto the eggs surface in a darkened space. So that light passes through, illuminating the internal form- if any. An unsuccessful incubation (or possibly non-fertile egg) will have a distinct fluid form and the yolk will be visible. A successful fertilisation and incubation will have evidence of a solid or evidence of a dense form, not fluid and possibly even visible veins. As the incubation progresses the form will become more opaque, eventually creating a shadow within most of the egg, allowing for an air sac at one end. We remove all the unsuccessful eggs, as this allows for room to set more. If left to sit, birds appear to be able to tell if incubation was successful also. As they will systematically discard eggs as the incubation progresses; allowing them to concentrate on the potential young. So you have turned your eggs til the 18/19th day and you are now waiting for the chicks to hatch. Again as the saying goes “don’t count your chickens before they’ve hatched” and this couldn’t be more true. Even with successful fertilisation and incubation, this does not mean you are guaranteed chicks. These little ones have quite a traumatic and exhausting beginning to their lives, and not all make it. You may hear chirping and tapping from inside the egg and even see the egg moving/rocking. This is normal and the chick inside is making a break for it. You may see a circular form appear, with a crack of 2 across it. Under which there is a break in the membrane allowing the chick t breath. Once they are strong enough (as this process can take a day or more), they will gradually chip their way around the end until they pop their way out… so yes they do crack the top off like the cartoon imagery suggests. It is very tempting to ‘help’ the young birds out, but you have to be careful if you do decide to do this. As if you tear the membrane it can and therefore the chick will bleed out. On the other hand exhausted chicks may become dried and not survive either. We will flick away the broken shell from the initial break through, insuring the membrane has been broken (so the little one can breathe). But then try not to interfere too much. Once out these wet alien looking forms may have a small sack or even the other part of the egg attached- leave this alone! They will detach naturally and absorb the remaining sack. They then need to remain in the incubator until they are completely dry and fluffy- 24-48hours. They do not need to eat/drink during this time (that’s what the remaining sack is absorbed for). So what do you do with them next? They still need to be kept in a warm, controlled environment. Naturally the mother hen would perform this duty by keeping them in under her wing (or general body feathers). 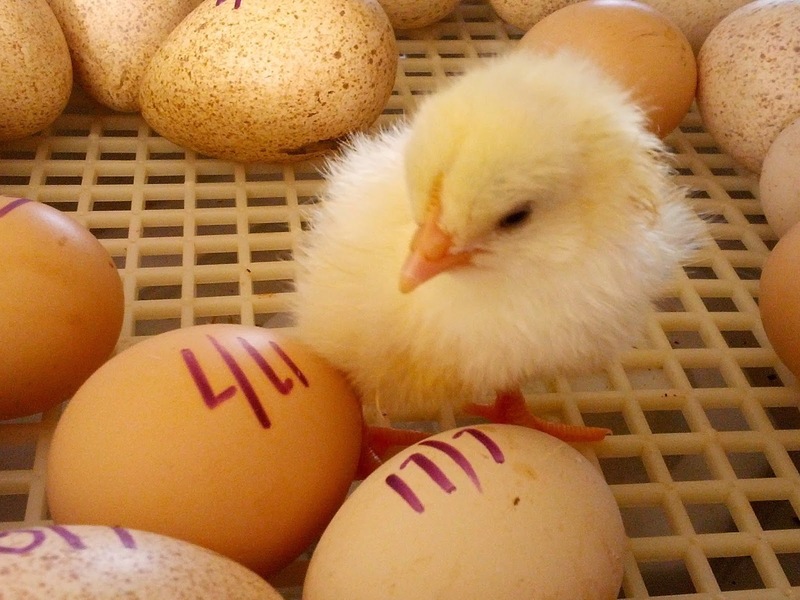 We mimic these conditions by placing them in a brooder box. Ours is constructed from an old wardrobe we have in the shed. That can be divided into numerous compartments, to accommodate a number of varying stages of chicks. But a simple cardboard box would suffice. Within your brooder box you will need to line the base (usually newspaper and saw dust), they will need access to water and food- we use this opportunity to treat our chicks for works and coccidious (these are just precautionary- it's a disease generally associated with intense breeding, as its passed through faeces. Not nice and can be fatal in young birds... so just in case) and the feed needs to be fine milled (or you can buy specific chick crumble- this will be high in protein and have a dose of the relevant medications already in it). Then you will need a means of maintaining the temperature- so we use a light and have a digital thermometer to monitor. We had to replace our light this week. Our previous lamp was a simple bulb plugged into a mains supply, with a lamp shade- bought from discount table at the local hardware store about 3 years ago; this finally gave up the ghost. So this time we bought a mains supply light, meant for use as an outdoor light. Our other light we use is a work light. The only problem with this one and the old lamp is that during the last 3 years the laws here in Australia have changed and all interior bulbs have to be ‘energy efficient’. This is great, except we were using the lights for their heat (a bi-product of the light itself and the most energy inefficient part). Therefore interior bulbs no longer generate the same level of heat that they used to. Hence the change to flood light style bulb, that in themselves are a bit more pricey, but the lower wattage bulbs (after all we don’t want to fry them!) will still produce the heat we require. This light is fitted to one end of the box. This allows the chicks to move away or towards the light, depending on the time of day. Fitting the bulb to one end of the box also allows us to either open up or divide our wardrobe set up into sections. So as the birds get bigger and develop feathers (and can maintain their own body temperature) we can give them more space. But if we have a number of birds at various ages/stages we mount the second light (our work lamp) and move he slightly older birds into this section (as they will require less heat from the lamp). Once you have your box with lamp be aware of your positioning of food and water. As you don’t want these under the lamps direct light. But you also want to allow for some space free away from it also. As you don’t want the chicks to huddle or congregate too close to the water, in particular. Like I said they will do this to get warm or cooler and they may fall asleep in the water… it has been known. I would also advise you don’t scatter too much in the way of saw dust/shavings near the water, so you will forever need to scrape it from the base. We also avoid using waterers with deep lips for the younger birds. Having lost a turkey poult this way in the past. Other suggest putting marbles of small pebbles in the bases to weight it down and prevent the water being too deep. I’m just not sure about placing foreign object too close to young birds, but if their large enough that they will not swallow them, then this shouldn’t hurt. Depending on the time of year and you climate, the chicks will need to remain inside for a good few weeks; definitely until they develop their proper feathers. And in the colder months I have been known to place a work lamp in their outdoor hutch at night for the first week or so. But then comes the fun time of transitioning them to their outdoor lifestyle.